the papaya ring spot virus causes extensive damages to papaya, watermelon, squash, cucumber and pumpkin. Scientists suggest that the best way to reduce the loss is to cultivate these plants at a distance from each other and avoid their monoculture. A study, published in the May issue of Phytopathology, has identified a kind of aphid (Aphis gossypii) as the predominant vector of the virus and suggested control measures. The researchers of Indian Institute of Horticulture in Bangalore, who carried out the study, say the vector can be controlled by growing papaya at least half a kilometre away from the other plants. To identify the predominant vector, the researchers exposed three types of aphids to infected leaves and transferred them to 60-day-old papaya leaves. Then they analyzed the scale on infection. "The ringspot virus affects crops at various stages and the scale of the effect ranges from 10-100 per cent, depending on the stage the plant has been infected," said H P Singh, deputy director general at Indian Agricultural Research Institute (iari), New Delhi. Affected plants become stunted leading to reduction of fruit yield. If infection hits the plant at very early stages of growth (one to two months), there might be no crop at all. At later stages, it reduces the fruit yield. "Once planted, the papaya plant is expected to give fruits for at least four to five years. 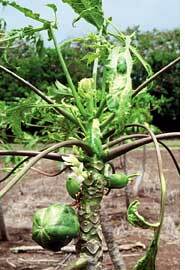 The virus turns papaya from a perennial to an annual plant," said Rakesh Jain, head of virology division of iari. At present, control methods include spraying insecticides in the nursery before taking seedlings to the field, checking for affected seedlings and replacing them with healthy seedlings in the nursery, avoiding staggered planting (for example 25 per cent planting in June, 25 per cent in July), monitoring for the presence of aphid vectors using traps and insecticide spray. India produces around 2,300 tonnes of papaya annually. In the past decade, the area under papaya cultivation in India has hugely increased following the introduction of Taiwanese and Hawaiian varieties. But introduction of these exotic varieties has also been accompanied with the rise in infestation of the ringspot virus and resultant losses. Initially, the virus had been reported in Uttar Pradesh and then from some other parts of north India. But between 1995 and 2000 it spread rapidly to south India as well. From vector control, the search is now on for a transgenic solution to the problem. "There are some non-edible varieties of papaya that are resistant to ringspot virus and scientists have isolated the virus resistant gene from one such variety of papaya. Now they are trying to plant it in Carica papaya, which is the edible variety of the fruit," says Singh. In Hawaii, scientists have created the rainbow variety, an edible variety of papaya by this method, but the Indian variety of ringspot virus is more virulent and rainbow papaya is not resistant to the Indian virus.